CMS issues a massive draft set of rule changes that it says will reduce provider administrative burdens, encourage price transparency, revamp the longstanding E/M codes to a single code in which physician payment is driven by time spent or medical decision-making required, and paying for virtual visits (although at a very low rate). From Another Allscripts Casualty: “Re: Allscripts layoffs Friday the 13th. Follows the voluntary early retirement program. I don’t know the numbers, but it definitely involved US-based support for ProEHR, ProAPM, and interfaces. Knowledgeable staff were released and offshore customer support will become even more prevalent.” Unverified, and I didn’t even bother asking because Allscripts always declines to comment on personnel issues. Another reader says he heard 70 folks were let go. I was thinking that as I write this, I don’t even have a good mental picture of what Allscripts has become – a distant fourth-place inpatient EHR vendor; seller of badly aging EHR/PM systems but with a newly developed product in the wings; acquirer of fire-saled unrelated products like Paragon, Practice Fusion, and NantHealth; or a pseudo HIT mutual fund trying to tap-dance investors into a buy-and-hold stupor by promising a better future involving genomics and population health? Even that master-of-none pandering to financial markets hasn’t worked out great – since Paul Black hired on in December 2012, MDRX shares are up just 13 percent vs. the Nasdaq’s 149 percent gain and Cerner’s 49 percent jump. Let’s hear from you, however – what has Allscripts done well and not so well and what would you do first thing if installed as King or Queen of Allscripts for a day? Speaking of Allscripts, I just noticed a subtle change in the company’s logo to make the L’s look like they’re rising and to darken the font. The change was made sometime in April or early May, according to cached copies of the page. Hopefully the rationale for the change made it worth what must have been a significant cost to swap it out everywhere. While I was looking over their site, I also noticed that seven of eight executives are male, as are nine of nine board members, which is high even in man-centric health IT. From Measly Metric: “Re: population health. The tools are promising, but where’s the process?” My take on population health is simple – one of the biggest threats to your health is getting pulled into the bosom of the US healthcare “system” and having your insurance milked and your body tinkered with, most often to your detriment even with good intention as uncoordinated experts blast their diagnostic and therapeutic guns in ready-fire-aim fashion. PHM sounds like a good idea as long as doctors get paid only if you stay well, but otherwise, many people would remain healthier by steering a wide path around financially motivated doctors and hospitals whose “health” expertise (versus “healthcare services sales”) is minimal. Whatever you do, try not to be admitted to a hospital, because the dangers there – both clinical and financial — are staggering. I’ve seen them firsthand as a member of various hospital committees that review the plethora of errors, lack of coordination, and outright bad decisions — the reality of regular medical mayhem versus the proudly displayed crystal awards in the tasteful lobby is jarring. Executives fresh off an admission to their own hospital – even in luxury suites with piles of extra attention – invariably marvel among peers at how lucky they were to escape without permanent harm. 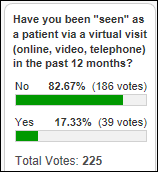 Virtual visits haven’t kicked much of a dent in the health IT universe, with 83 percent of us never having participated in one (and I generously included “telephone” in the category). 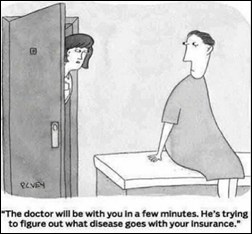 Judy says Doctor On Demand costs her just $5 on her employer’s plan and she has avoided at least three ED/urgent care visits as a result. Carla loved a Sunday afternoon session for an infection. Allen says his insurance covers only office visits, making me wonder why employers wouldn’t embrace them to keep employees productive instead of wasting half a day driving and waiting. Jim loves MD-Live for routine issues and care in rural areas, noting that he was able to choose a highly qualified doctor from a list instead of paying retail clinic prices that now cost about as much as a PCP visit but that mostly use NPs/PAs instead of doctors. New poll to your right or here, which popped into my head while I was thinking about Allscripts: who is the best CEO among the largest inpatient EHR vendors? Vote and then click the poll’s “comments” link to explain what “best” means to you and why your choice qualifies. Listening: Australian singer-songwriter Courtney Barnett, an interesting combination of blandly delivered but smart, observational lyrics paired with her stripped-down guitar. Sample lyrics: “Tell me I’m exceptional and I promise to exploit you” and “I think you’re a joke, but I don’t find you very funny.” She’s one of those musicians whose modest singing and instrumental skills transform into something great just because it’s her words and her unpretentious, non-computer enhanced knack for saying what everybody feels. Music goes through predictable cycles where audiences finally rebel against corporately backed, wildly overproduced mindless mainstream pop, and when it happens again, Courtney will be ready. New Ascension-owned process automation vendor Agilify hires Doug Thompson (NextStep Solutions) as president. The VA creates an Office of Electronic Health Record Modernization to oversee its Cerner implementation, to be headed by Genevieve Morris, who is on loan from ONC as principal deputy national coordinator. 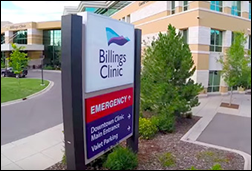 The email account of an employee of Billings Clinic (MT) is hacked while he or she is traveling overseas, exposing the information of 8,400 people who were mentioned in the employee’s emails and attachments. JAMIA President Doug Fridsma, MD, PhD says in a BMJ editorial that medical students should be taught health informatics. As a regular Waze user, I’m happy to see that the Google-owned GPS app will give cities access to its massive amount of traffic and driving data to support real-time emergency notifications and long-term infrastructure planning. Mobile Heartbeat adds Amplion’s Alert nurse call system to its MH-CURE clinical communications and collaboration smartphone app. Summit Healthcare raises $3,900 for A Gift for Teaching, this year’s Heart of MUSE Foundation recipient. Optimum Healthcare IT is named as one of Jacksonville, FL’s list of fastest-growing companies for the third consecutive year. ZappRx will exhibit at Integrate 2018 July 23-25 in Philadelphia. ZeOmega releases a Jiva customer success video featuring MCG Health. The Mexico Coca Cola debacle sounds a lot like Sweetums from Parks and Recreation. Pawnee – first in obesity and third in happiness. “I don’t even have a good mental picture of what Allscripts has become – a distant fourth-place inpatient EHR vendor”. I presume #1 is Epic, and #2 is Cerner (please correct me if I’m wrong) – who is your #3? KLAS’s report from last year shows that the top three inpatient EHR vendors by hospital count are Epic (26.7 percent), Cerner (24.8 percent), and Meditech (17.0 percent). Allscripts had 7.2 percent. Meditech also took #2 acute EHR (rated, not market share) from Cerner in the last year. Cerner’s user survey scores have dropped off a cliff since DoD became a customer and VA selected them. Tough to know if it’s DoD users submitting surveys or all the other previous customers being ignored. Can’t wait to see the slides from that presentation.